The 7th edition of the RORC Caribbean 600 is looking like a real cracker and proving irresistible to a variety of yacht racing teams from all over the world. An international fleet of over 50 yachts has now entered the offshore blast around the Caribbean, indicating that last year's record entry of 60 yachts may be bettered. Yachts flying the flags of 13 different countries will be competing in this year's race: Antigua, Australia, Belgium, Canada, France, Germany, Great Britain, Italy, Lithuania, The Netherlands, Russia, Spain, and the United States of America. The Caribbean is, without doubt, one of yacht racing's most exhilarating playgrounds with the warm trade winds and Caribbean swell providing superb sailing conditions. The RORC Caribbean 600 course, starting and finishing in Antigua, is designed to provide a challenging, high speed racetrack and its popularity has grown, year on year, since the first event in 2009. 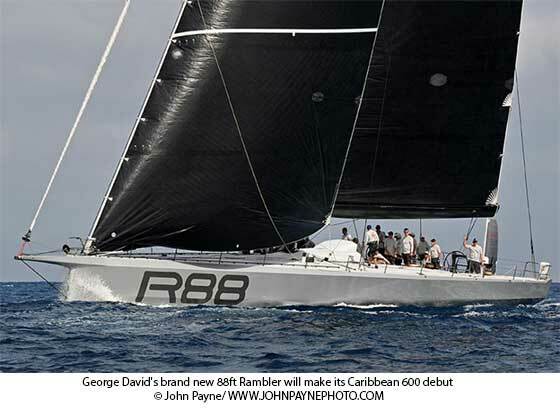 George David's Rambler 100 set the monohull course record in 2011, scorching around the track in 40 hours, 20 minutes and 2 seconds but this year's line-up is likely to be the most competitive for line honours so far. George David's brand new 88 ft Rambler will make its 600 debut with an all-star crew containing many of Rambler's old guard plus some new, world class, sailors including multiple America's Cup winner, Brad Butterworth and Volvo Ocean Race winners, Stu Bannatyne and Brad Jackson. Also in contention for line honours is Australian yachting legend Syd Fischer racing Ragamuffin 100, which is being shipped to Antigua from Australia, and Mike Slade's British 100ft Maxi Leopard, which took monohull line honours in the first edition of the race, makes a welcome return, and two Volvo 70s will also be vying to be the first yacht to complete the course, Giovani Soldini's Italian Maserati and Andrew Budgen and Fred Schwyn's British Monster Project. Rambler's Project Manager, Mick Harvey, was full of excitement about the race: "George David has always been a strong supporter of this race because it is such a fantastic course with great conditions, but also because George David, like me and other crew, are members of the RORC and we just love to take part in this race. This will also be the first race of the Atlantic Ocean Racing Series, which is our priority for our first season. The boat is going well. As always there are a few adjustments, but all things considered, we are very happy with the new Rambler and looking forward to Antigua. This year there is a lot of good competition for us but we will concentrate on our own game, as that is all we can influence until the race start." 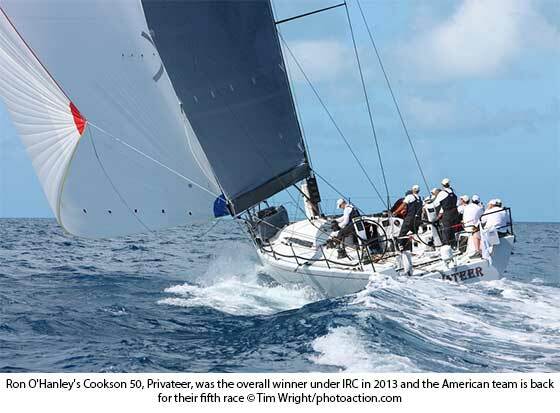 Ron O'Hanley's Cookson 50, Privateer, was the overall winner under IRC in 2013 and the American team is back for their fifth race. Hap Fauth's American JV72, Bella Mente, has won her class before but will be setting their sights on the overall victory that has eluded the American Maxi 72, which has been second overall for the last two editions. American Reichel Pugh 63 Lucky, sailed by Bryon Ehrhart, will be making its debut in the RORC Caribbean 600, as will British TP52, Sorcha, sailed by Campbell Field. The all carbon German flyer Carkeek 47, Black Pearl, sailed by Stefan Jentzsch, will also be making its RORC Caribbean 600 debut. Dutch grandmaster Piet Vroon is no stranger to the RORC Caribbean 600, having won IRC One on two previous occasions but the 2015 RORC Caribbean 600 will be the first offshore race for Piet on board Ker 51, Tonnerre 4. "It is very exciting to be racing Tonnerre 4 for the first time and against different adversaries and it will probably be harder for us," commented Piet Vroon. "Tonnerre 4 will be much the same crew as we have had in recent years and I am looking forward to racing with them. 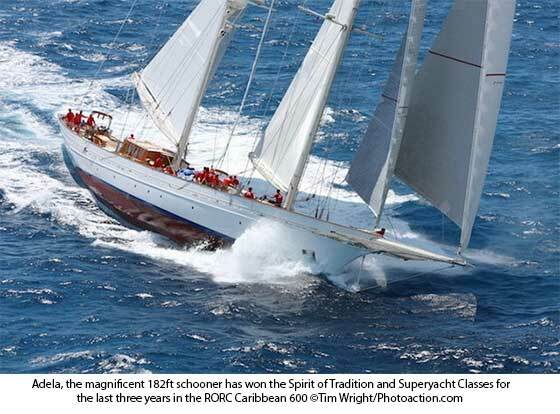 I like offshore sailing and the RORC Caribbean 600 is a prime example. The route is very varied and no part of it is straight forward, with plenty of local weather effects which must also be considered during the race and the route is an interesting one, as we race around 11 islands. From a tactical and navigational point of view, this is very demanding. If you could import the same weather conditions for this year's Fastnet that would be great!" Adela and Athos are spectacular and graceful from the days of old but are designed with innovative features and technology that exponentially enhances their speed and power to an incredible level. The 203ft Schooner Athos and the 182ft Schooner Adela will be taking part in their third encounter in the RORC Caribbean 600. Adela has won the Spirit of Tradition and Superyacht Classes for the last three years, but Athos provided exhilarating competition last year, finishing less than 39 minutes behind, after two and a half days at sea. Adela's helmsman Stan Pearson, who was the co-founder of the RORC Caribbean 600, believes this year's battle between Adela and Athos will be even closer. "In the last two races, Adela has sailed the best she could and didn't leave much on the track and this year I think it will be a right old ding dong," commented Stan. "Adela is now as good as she can be and the crew work on board is fantastic, so there is not much Adela can do to improve. Athos improved enormously last year and I expect her to be even better this year. Athos is longer than Adela and assuming a regular easterly, the course has 65% on eased sheets, which should be to Athos' advantage, the course is absolutely suited for big boats such as ketches and schooners." Of the 10 yachts currently competing in IRC One, the cosmopolitan entry list come from six different countries. On paper, two highly diverse American yachts should be the fastest around the course: New York's Jose Diego-Arozamena has been the proud owner of Farr 73, Maximizer, for over 20 years, racing in the Mediterranean, the East Coast of the USA and the Caribbean. Maximizer should be well matched with William Coates' Ker 43, Otra Vez, from Houston Texas, which has a proven track record, winning several prominent Caribbean inshore regattas. 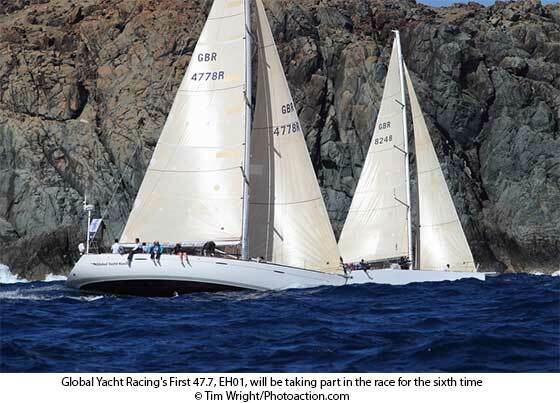 In IRC Two Global Yacht Racing's First 47.7, EH01, will be taking part in the race for the sixth time. EH01 Skipper, Andy Middleton believes that the class favourite will be his good friend Ross Applebey, skipper of Oyster 48 Scarlet Oyster, which has won the class on two previous occasions. "I sailed with Ross on Scarlet Oyster for the Rolex Middle Sea Race and we ended up without a rudder, lashed to a fishing boat in a full blown gale. In situations like that, you really find out who your friends are!" laughed Andy. "There are a number of race charter yachts in our class for the RORC Caribbean 600 and that really does make for a great competition between us. The course is a fantastic way to race around the central Caribbean, which is one of the most spectacular places to sail, anywhere in the world." Seven yachts of less than 40ft have already entered the race, proving that the RORC Caribbean 600 is not just for the Maxis. Local Antiguan, Bernie Evan-Wong, who has participated in every edition of the race, is back with a new boat, RP 37 Taz and a number of smaller yachts have sailed across the Atlantic to compete in the RORC Caribbean 600, including Louis-Marie Dussere's French JPK 10.10, Raging Bee, which won IRC Three and the Two-Handed Class for the 2014 RORC Season's Points Championship. Veteran RORC members Peter Hopps racing Sigma 38, Sam, and Peter Schofield racing HOD 35, Zarafa, will also be competing. 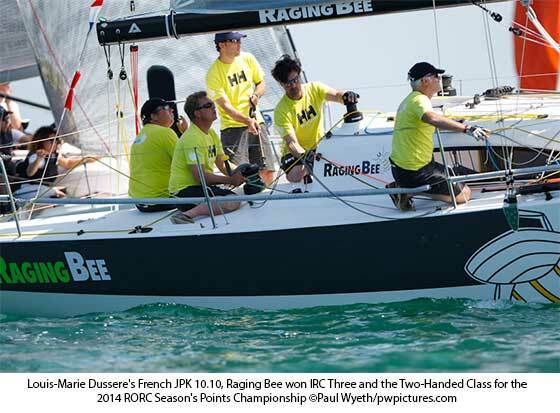 "This will be my third race but the first with Redshift and we will be a crew of six," said Nick Cherry. "It will be a tough race for us. The bigger, faster boats will get up on the plane and we will be displacing all the way around the course. However in IRC Three, we should have a chance and with so many corners, we hope to make gains because Redshift is easy to handle. Looking at all the 600 mile races, this is the course I would choose to do: plenty of fast sailing, loads of corners and lots of rocks to watch out for, so there is always something going on. I think we will have a flexible watch system as there will be plenty of sail changes and manoeuvres to nail. Compared to training in Brittany for the Figaro, with 10 degree water over your head, this race should be far more pleasant and this is the first part of our training for the Rolex Fastnet, which we will be doing Two-Handed. For the 600 we want to get round quickly, so we have plenty of time to enjoy the party afterwards."